State Examination Board Is Going to conduct Examination 26-07-2015. All candidates can download their Gujarat TET 2 Hall Ticket online. State Examination Board will be held Teacher Eligibility Test -2 for upper teacher Job. The examination will be held on 26 July, 2015 at various exam center. 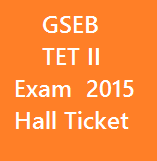 The candidates who have applied for this exam can download their tet hall ticket form official site ojas.guj.nic.in. Candidates need confirmation number and date of birth to download tet call letter 2015.